The ZIP file comes with a GIS shapefile and a Google Earth KML file. Data includes the Property Index Number (PIN), zoning district, ward, community area, TIF district (if applicable), and nearest CTA and Metra stations. There are 12,986 parcels in the dataset; current as of August 2, 2016. 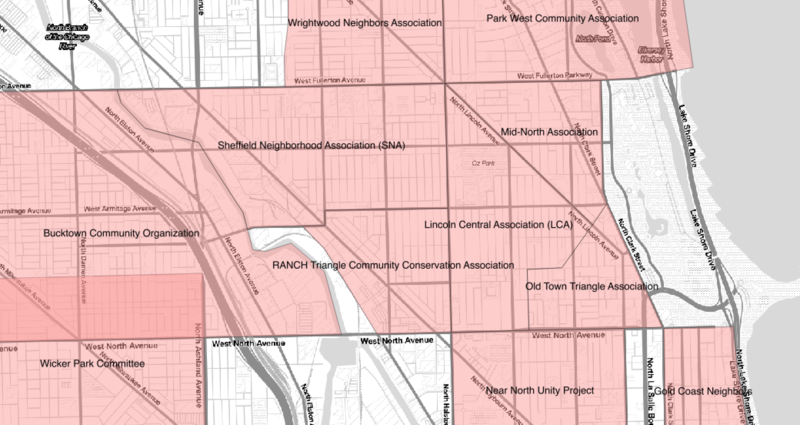 The ZIP file contains a shapefile package (projected in 3435) and a GeoJSON (projected in 4326) file showing the boundaries and names (and websites where available) of 65 neighborhood groups that have influence on local zoning and planning proposals. Current as of February 11, 2018; contact us to request and purchase a more recent version. 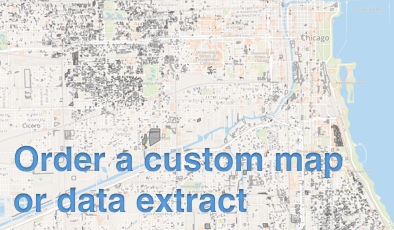 Contact us to discuss the kind of custom map or data extract you're looking for. This dataset has details for 1,879,504 parcels, properties, and condos in Cook County, including property tax bill values between and including the 2009 and 2016 tax years, assessment values, appeals status, exemptions, building size*, building age*, and lot size*. It also has geography for every property, ready for analysis in a GIS format. This is the same information that our Cityscape Pro members have access to in a filtered form, and this is the only way to get the entire dataset. 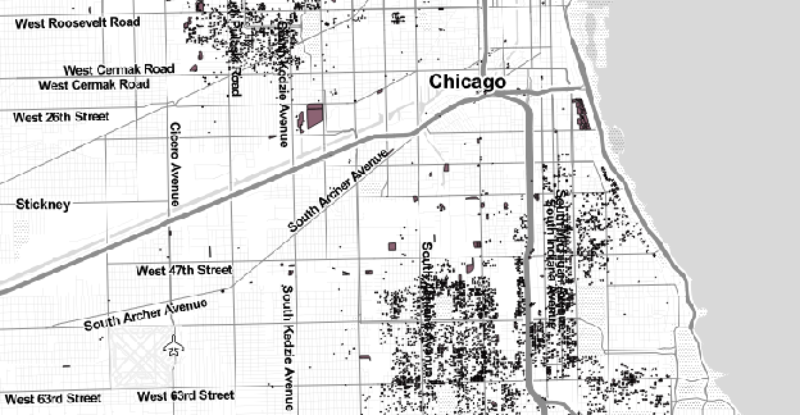 This dataset is also available with 86,136 vacant parcels only, for $199.00. * These fields are "where available" as the detail doesn't exist for all properties. It comes as a GeoPackage file for GIS, and as a CSV file for spreadsheet software. Because the file is 1.3 GB compressed in a ZIP file, we will send you a personal download link. Purchase one of our map layers. Each one is $50, or get all of them for $400. 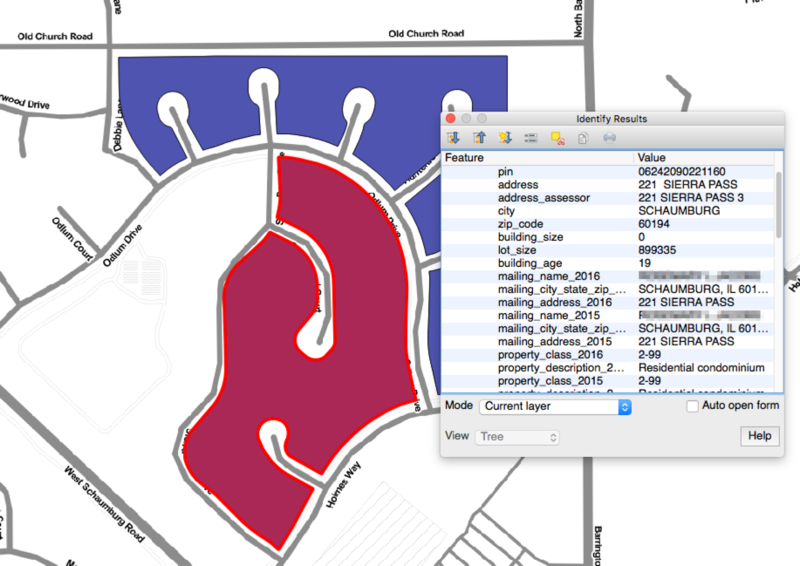 You'll receive an ESRI Shapefile and a GeoJSON file for each layer.